The Swami and his ashram; the infant who was left at his doorstep and grew up to be his protégé; the young, English journalist who hopes to make it as an international news journalist and finds her big news story when her friend‘s body is pulled out of the Yamuna: these have all the makings of a Bollywood-style novel. The twists in the tale are unexpectedly obvious, and Kathleen McCaul manoeuvres the plot from revelation to revelation rather awkwardly. If you’re going to enjoy this novel, you must employ a rare degree of suspension of disbelief. 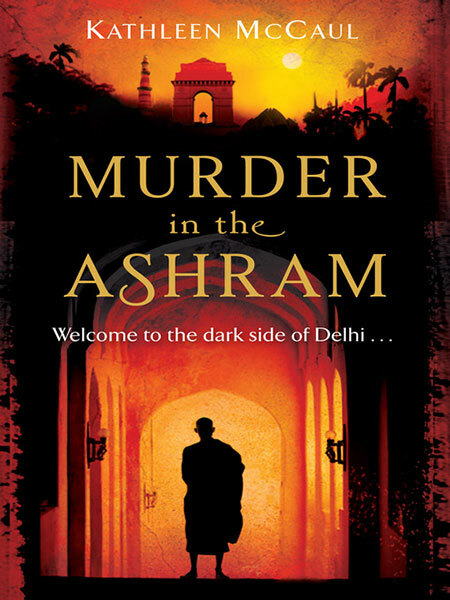 Murder in the Ashram book cover. Ruby is young and optimistic, and on the lookout for a news coup that will make her career. Tired of her desk job and ready for something more different, where else does the world look when looking for the exotic, a break from the mundane, if you will? So Ruby ends up in the terribly exotic land of India and the cacophonic streets of New Delhi, no less. She happens to bump into an old classmate from college, Stephen, who needs a roommate and thus our series of unfortunate (and some fortunate) events begin. They enroll at a yoga class where their instructor is, just as the stories tell, gorgeous and elusive. Soon enough, Stephen and Ruby have struck up a friendship with Raj, the instructor who is also the protégé to the serene Swami. Predictably, in the fashion of babas and swamis who have recently made the news in the real world, all is not as it seems. In the meanwhile, Stephen is looking for his father who he has never met and doesn’t even have a first name for. As they trudge through Old Delhi, looking for clues of his father, they meet an odd ensemble of Indians, sample the local street food and McCaul makes a spirited attempt in the amused manner of outsiders to bring out the Indian-ness in things. When Stephen’s body is pulled out of the Yamuna, it will open up a portal into the muddy trails and grimy fingerprints of police officers, spiritual men, and newspaper opportunists lurking in Delhi’s underbelly. The book starts off as interesting, and the pages are easy to turn, but slowly the plot picks up momentum and loses focus in the process. It’s written in the style of journalism; uncomplicated by metaphor or elaborate passages about nothing and everything and is simply put without stripping bare the language to the point of boredom. The book is an easy read, without being a completely trashy one. Its biggest weakness is the plot, but McCaul writes engagingly enough for the book to be read once and discarded thereafter. If you’re a fan of both mystery and theatrics, and have a thing for unlikely heroines who uncover clues with equal measures of ingenuity and luck, this book is for you. By Shruti Rao · T. S. Tirumurti sets the stage for a tale of duty, love, and family that spans across continents and generations.